WSBF 88.1 is Clemson University's radio station. WSBF is fully managed by students, and is open to all undergraduate students, graduate students, and community members to join and host shows. The station's office is located on the third floor of the Hendrix Student Center. WSBF currently broadcasts at 3000 watts across the Upstate, reaching into Greenville, Pickens, Anderson, and Oconee counties. WSBF puts on a few free concerts every semester, featuring regional and national artists. The shows are open to all ages. Past shows have been held on Bowman Field, Amphitheater, Edgar's, Explorer's, Nick's, the Blue Heron and The Den. In past years (2003-2005) WSBF and WUSC have held a joint show the Friday night before the Clemson versus USC football game. WSBF-FM began as a closed-circuit broadcasting facility of 600 kilocycles on May 1, 1958 with the words, "Good Afternoon, this is the high fidelity voice of Clemson College". (TAPS 1959, pages 238-239.) It made its first over-the-air broadcast on April Fool's Day of 1960. The original transmitter unit that powered the station via the electrical system in the dormitories (primarily Johnstone Hall) still exists, and has been preserved. The station quickly became known as "wizz-bif," and in the early days broadcast such shows as Bob Mattison's (the "Voice of Clemson") agricultural shows, which were also broadcast on AM stations in Anderson, Spartanburg, and Columbia. Other early shows included a show broadcast from Harcombe in the mornings, a "Late, Late" show featuring old standards, and a "Concert Hall" show featuring the classics. In 1961, adverts in The Tiger proclaimed that the station offered the most news of any radio station in the Upstate. By 1965, WSBF had changed format to include "The Frank Howard Show," "Pigskin Preview," "Night Beat," and "East of Midnight." The purpose was to provide students with educational entertainment, news, and music. Music format ran to the Top 40 model in the mid to late 1960s. The studios were located on the eighth level of the Johnstone Hall complex, two floors above the Loggia. The next major format change occurred under Woody Culp, changing to "progressive," in the spring semester of 1972. An article in The Tiger on November 12, 1971, states that the decision to change followed a telephone survey of listeners several weeks before, and that the response was favorable. This coincided with the national rise of previously under-valued FM stations all across the dial as a source of "underground" and alternative formats. (See WSBF from Top 40 to Progressive) The strategy at that time was to give heavy airplay to new groups. Off-beat news stories and non-Top 40 music was emphasized. Mutual News was carried throughout the 1970s, and the station had Associated Press wire service ticker. Jazz was frequently played around suppertime during the week, and in 1974-76, "Country Dave" Polk played the Nashville sound on Saturday mornings. Long-time Anderson rock jock Bill Walker held down the Friday afternoon "Mystery Roach" show in the mid-1970s. In the late 1970s, "Sister Salvation", one of the Wild Children, had a Wednesday night show where the Grateful Dead and the Jefferson Airplane were heavily featured. Jim Stephenson, a long-time Voice of America sports correspondent, began his radio career at WSBF with his "Sound Chaser" show. Long-time Upstate radio personality Russ Cassell had his start at the station with a community talk and discussion program. 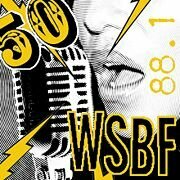 WSBF's long-standing logo of a woman in a wide-brimmed hat and off-the-shoulder dress with a microphone was designed by an architecture student in a ~1977 contest - the prize was a pony keg. She is known universally as "The Lady", and her portrait on a wooden plaque is one of the few items from the old station facility on the 8th level above the Loggia to make it to the new Hendrix facility. In the late 1970s, the primary studio on the 8th level of Johnstone Hall, featured two turntables to the right of the control panel, a stack of 8-track-style cart machines for PSA announcements, the board, and, to the left, record bins. An indestructible Crown reel-to-reel 12-inch recording deck was located behind the announcer's chair to the right. WSBF officially went stereo on November 6, 1978 although the signal was still not actually channel separated for several more weeks, a dark secret that the engineers snickeringly kept to themselves. Joe Della-Fera's "Protogressive Show" has been a Saturday or Sunday evening fixture for almost two decades, 7 p.m.-9 p.m.
Jim Stevenson, Sports reporter for Voice of America, Washington, D.C.
On the weekend of March 7-March 8, 2008, the station celebrated its fiftieth anniversary with a concert in the Hendrix Center on Friday night, and a banquet for alumni and current WSBF staff on Saturday night. David Suggs and Van Fair, the "S" and the "F" in the station callsign, both addressed the reunion dinner. Van emphasized the need for the station to consider the changing nature of FM radio to survive into the future in his remarks. His comments led a number of alumni from the 90s to walk out. Alumni jocks did fifteen minute shows throughout Saturday's programming. A de facto WSBF reunion took place at Nick's on Friday night, and was continued on Saturday night, and after the constituents were thrown out on Sloan Street at midnight, the WSBF meeting adjourned to The snake pit, where a keg of the finest Pabst Blue Ribbon awaited. 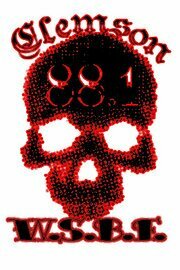 Here is an image of WSBF's fifitieth anniversary sticker that was designed by Lee Simmons. Members of WSBF have been known to host a number of House Shows throughout the years. Super Taco is an official friend of WSBF. Nick's Tavern is an official friend of WSBF. This page was last modified on 22 March 2010, at 23:52.